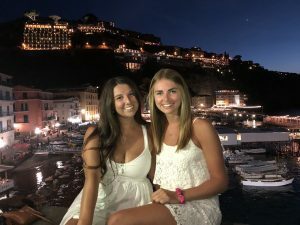 We caught up with SAI Ambassador Brianna, who took some time to answer questions about her summer in Sorrento. Studying abroad was something that I had always dreamed of doing, so when it finally happened I couldn’t even believe it. I have always had a passion for traveling and experiencing the world and the variety of cultures it has to offer. It was amazing to immerse myself into the sunny and sparkling town of Sorrento, at the beginning of the Amalfi coast. The people were sweet and welcoming and offered more hospitable limoncello shots than I thought were imaginable. It turned my roommates from strangers into great friends that I still keep in close contact with everyday. 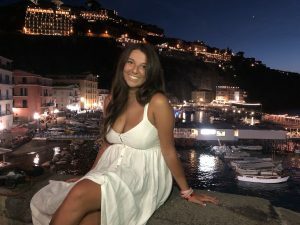 My study abroad experience was much more than an experience, it was an adventure and a step out of my comfort zone, which allowed me to pursue things I never thought I’d ever do. 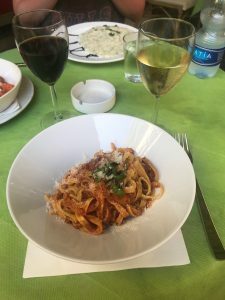 I immersed myself into a new culture, tried new foods, and even mastered the art of traveling alone in a country with a language barrier. 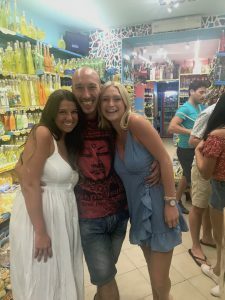 Limoncello salesman near our apartment who we became friends with! EXPLORE. There was so much to see and do in what felt like such a small town, so my favorite thing to do in my free time was to explore the possibilities. Strolling down cobblestone streets trying the gelato shops on every corner, or walking down to the beach for a refreshing day in the sun. Everything was new and an experience in itself. 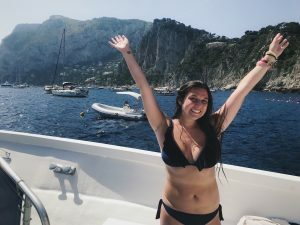 My favorite adventure was when I dragged my roommates (at 7AM) to hike up to the Bagni della Regina Giovanna and layout in a private cove that looked out into the Mediterranean. It was the most amazing view, with crystal clear waters and a secluded feel to an amazing place. What travel tips would you give someone studying abroad? What advice do you have for new study abroad students? Push yourself out of your comfort zone. You have made it halfway across the world, so you are already outside of your own bubble of comfort. Push yourself even further, indulge in foods you otherwise wouldn’t, take up the language, socialize with the people in town. Everyone is friendly and has something to offer your experience, so don’t hold yourself back from it. When you look back on your experience you aren’t going to want to wish you had, you want to be happy you did. This experience is once in a lifetime, so make every moment count. There is so much to see and do, sometimes waking up early and going to sleep late is worth it. At the end of the trip, you’ll be happy you did. 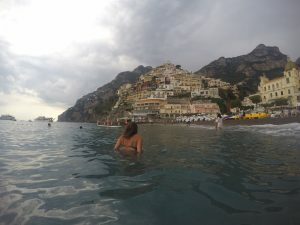 Positano, a short ride from Sorrento on the Amalfi coast, and an amazing view! I never want to stop traveling and exploring the world. It has encouraged me to push myself further out of my comfort zone to try at applying to jobs and internships abroad. I long to go back everyday, it has made me consider even moving to Italy full time and pursuing a career there. Studying abroad changed my perspective on the world and opened my mind to the endless possibilities there are for us out there. The ladies that made my experience so great, and made leaving so much harder. 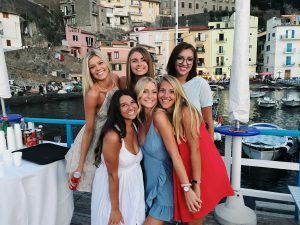 Brianna was a summer 2018 SAI Sorrento student from West Virginia University.